The new pearl white setup! Great music combined with amazing setups! Check out the gallery and screening page! Camera Man Feed, Live Video Mixing Names And Pics. Want to make your event a colourful dream and vivid fantasy that will create the most amazing memories? Planning your wedding or special event rigorously without the risk of any awkward blunders takes a lot of experience and expertise. If you are looking for the best professionals around to make your special day truly special, AK Musik has the best Asian DJ services to make your dreams come true. AK Musik offers not only DJ entertainment but our services range from providing the best sound to providing the best visuals and lighting to bring your event to life. DJ Arun Kalyan offers the ultimate entertainment experience if you’re looking for Indian DJs, wedding reception DJs or a Bhangra DJ for hire to enhance your event; he represents the cream of the trade. It is your ideas and your dreams that AK Musik targets to enhance and we have all the ingredients to make it a reality. The music is mixed with utmost care blending a fusion of styles to bring the best possible balance of sounds and excitement. 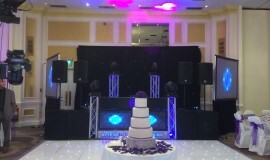 Professional Indian DJs and Bhangra DJs the calibre of AK give you nothing but the best Asian DJ entertainment. Our testimonials page gives you a little taste of the fun, flavour and pleasure we offer our clients. Press play below and watch our most recent event!